A visiting author who spent a day with pupils at Rose Court was so impressed that she nominated the school for a special award from The Society of Authors. Vivien Sabel is a psychotherapist and author of Robot Meg: She Lives in my Head, who visited Rose Court to talk with Y1 and Y2 pupils about her book, a fun story in rhyme which helps children to address the negative thoughts they might experience even at a very young age. After the visit, Vivien was moved to nominate Rose Court for the Reading for Pleasure Award of the Society of Authors (Children’s Writers and Illustrators group). The society developed the awards scheme in response to their member authors, who visit schools up and down the country and wanted to recognise those which go the extra mile to encourage children to read for pleasure. Jo Hall, head of Rose Court, said: “The award is a total surprise and I’m delighted that we have received this recognition of our promotion of the enjoyment of reading. 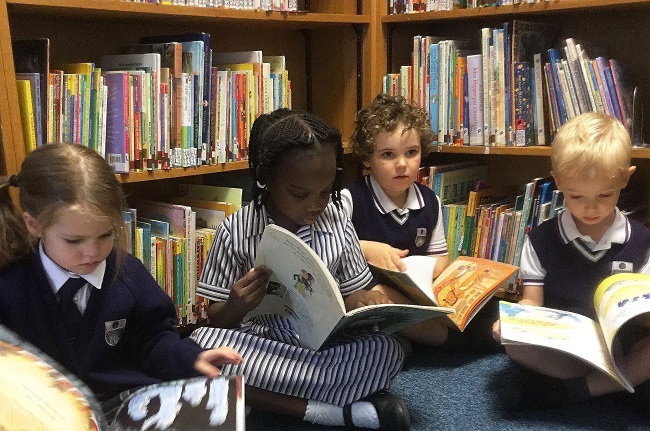 “Sharing books with our young children and teaching them to read independently is such a wonderful part of our work at Rose Court and we hope that all our pupils will continue to read for pleasure throughout their lives.